Eutrophication of Deep Lakes focuses on research and experiments that are deemed valuable to mitigate the eutrophication of lakes. Containing the contributions of authors who have continuously conducted studies in this field, the book proceeds by pointing out how the loading concept can serve as a basis in the control of eutrophication. This discussion is seconded by discussions on the factors affecting the eutrophication of freshwaters in Norway. Particularly given attention in this book is the phosphorous content of small and large lakes. The relationship of pollution and eutrophication is also noted. 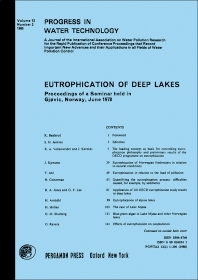 The large inputs of nutrients into lakes is emphasized, and then the application of the US OECD eutrophication study results to deep lakes is discussed. The book also points to the stage of eutrophication of lakes in Norway, and particularly concerns the effect of eutrophication on living organisms in lakes. A review of the toxic substances that affect these organisms is also presented. The text is a valuable source of information for researchers and readers who are interested in studying how eutrophication affects the natural composition of lakes; how this process affects life in lakes; and the control measures and processes that need to be taken to control it. 4 - What Kind of Results Have We Obtained from This Programme? 5 - How Far Did These Preliminary Results Meet Our Expectations?